Bringing a greater awareness of and appreciation for jazz, blues and world music. The era of swing jazz is said to have began in the early 1930’s and carried on into 1940’s but, like any musical style it is next to impossible to get a handle on what exactly defines the different stylistic periods within the music’s history. Swing is said to have been born when rhythm sections in jazz bands started using a four-to-the-bar beat instead of the two-beat emphasis commonly used in Dixieland and New Orleans style jazz. This new rhythm coupled with the horn sections that used more surprising syncopation techniques gave the music a sound that seemed to have a swinging motion, leaving listeners with the compulsion to get up and dance. Some argue that it was the dance that inspired the music and not the other way around. It is said that when people started dancing to jazz in an “edgier” fashion the performers had to adjust their style to keep up with the people on the dance floor. Regardless of its origins there is no debate over the fact that both the music and the dance go hand in hand giving birth to such sensational dance forms as the Lindy Hop, the jitterbug, the St. Louis shag, and countless other extravagant dance moves. The swing era may have started in the early 1930’s, but the seed was planted in the 1920’s. Many claim that it was in the mid 1920’s that Louis Armstong, with his unique timing, phrasing, and overall style on the trumpet, was the pioneer beginning the evolution of swing jazz. Through its growth stages, it wasn’t until the mid 1930’s that swing had really “taken off” with appearance of “The King of Swing,” Benny Goodman. 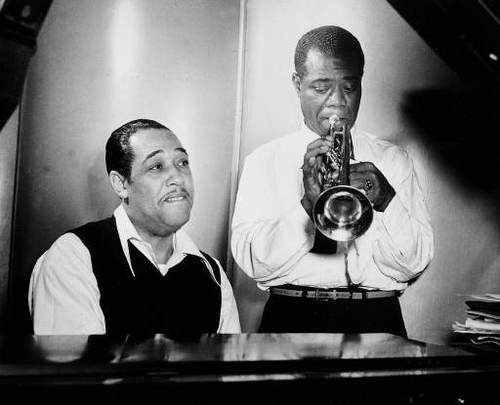 Although Goodman is credited with the popularizing of swing music, much of the success belongs to jazz greats such as Fletcher Henderson, Duke Ellington, Bennie Moten, and Count Basie, who were not given the recognition they deserved, due to the colour of their skin in a time where racism was prevalent. Though the swing era is often considered the golden era of jazz, it, like many things, couldn’t survive the Second World War. Due to the large number of band members that got drafted, the remainder of the band was forced to hire whoever they could to fill the void, often resulting in taking on unskilled musicians. Another factor contributing to the death of swing was that during the war fuel rationing made touring next to impossible, especially since most swing bands were comprised of more than ten musicians. Through the necessary demise of the swing era, just as its predecessors, it made way for the perpetually changing sound of jazz.